My husband makes the best fried rice. This is his fried rice with cashews. I recently posted about his Stir Fried Quinoa, which is also delicious. That day, we were out of some of the main ingredients so he improvised. This is the real version. I could literally eat this entire bowl. 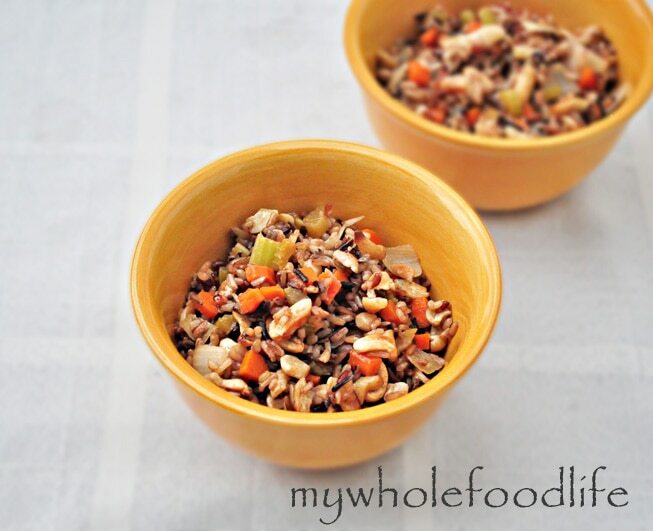 Since there is wild rice as well as cashews, this can be considered a full meal and not just as side dish. It would a great Meatless Monday dish. This is also a meal that comes together in minutes. I am all about easy meals. In a pan, saute all the ingredients except the rice and cashews, for about 7 minutes on medium high heat. Add the rice and cashews and cook for another 5 minutes, stirring frequently. That’s it. Enjoy! If you use raw cashews, you may want to toast them for a few minutes to bring out more flavor. Made this for dinner tonight - used the ends of some veggies I had left in the fridge - yummy! How many servings does this make? I would like to make it tonight, it looks great. I've made this twice in the last couple of weeks. Delish! We served it with beet greens and rainbow chard. Awesome! I love rainbow chard and never thought to throw it in! Thanks for the idea. Glad you like it! I am not sure if you can. I haven't tried, but I would love to know the results! It should keep at least a week. Edamame are soybeans. They can also be replaced with peas if you avoid soy. Mirin is a Japanese cooking wine. You can find it in the Asian sections of most grocery store. It ads a bit of sweetness to balance out the saltiness of the soy sauce. Hi there! Thanks for all the great recipes! I was planning to make this tonight, but do not have the miren or plum vinegar. Any suggestions on what I could substitute? I do have rice vinegar on hand... Also, many of your recipes call for dates. Are dried dates okay? And, if so, do you soak first? Thanks!! Dried dates are fine. That is what I use. If you have a high powered food processor, then there is no need to soak them. The mirin adds a little sweetness to the dish. You might be able to mix some rice vinegar with a tiny amount of sugar to get something similar? I hope you enjoy the recipe. It's one of my faves. Once again, awesome. Once again, I am very glad that I found your site. For the past 7 month's I've been cutting the high reliance of meat out of my diet - only having it once a day, at most. But I don't miss it much when I can get great tasting meals, made of nuts and/or nut butter. At the same time, I added chicken to this dish because its been a while since I've eaten chicken. I look forward to trying the next recipe. I am so glad you enjoyed it! This is one of my favorite recipes. So delicious! Even our picky kids ate some of it. I love how versatile it will be. We can use whatever vegies we have on hand. Glad you liked it! This is one of my family's absolute favorite recipes. I dont like lime, is it necessary? You can probably omit it. Made this for dinner last night and another batch for lunch today since I had extra rice. Loved it!! So easy to make! Awesome! It's one of my most favorites! We make it often here. Thank you!! Yes you can use grapeseed. The toasted sesame oil adds a good deal of flavor though. I just made this for dinner and it was absolutely delicious! I didn't have any wild rice so I used basmati rice and not a grain was left! Thank you! That is awesome! Glad you enjoyed it. Hi, could you sub the umeboshi plum vinegar for apple cider vinegar? I can't seem to fine the plum vinegar anywhere. Or is there another vinegar I could use? I am not sure apple cider vinegar will work. You can probably omit it? I get the umi vinegar at Whole Foods in the Asian section. looks delicious and filling. I think i will make a t to night and sub English peas for soy. Thanks! That would work out great I think. Made this for lunch today. Used snow peas instead of edemame. I had to use rice wine vinegar and no Moran but it was atill very tasty although a little tart. That probably due to not having right ingredient. I will make it again. Live 75 miles out in west Texas from any good grocers. Made this tonight, and it was delcious!! We have cashew and sesame seed allergies in our house, so subbed peanut oil for sesame oil and peanuts for cashews. This is definitely joining our dinner rotations. Thank you!